We're pleased to release this PANZER DIGEST NAVAL SPECIAL 2008 SUPPLEMENT, which is a special edition of the magazine, dedicated to naval wargaming. Next, there are inserts providing additional warships for Minden naval games. BATTLESHIP CAPTAIN Sheet 25 gives two dozen "What If?" warships from World War I and II which were planned, begun, but never completed. These ships come from a variety of national navies (Britain, Germany, Japan, Russia, Italy, the United States), and are fully compatible with other Battleship Captain game components. Further, there are twenty-four new ship counters for the NAVTAC 1914 system, enabling players to recreate many more Mediterranean scenarios, with additional ships from France, Austria-Hungary, Britain, and Germany. LINKS Visit the PRICES PAGE for complete ordering information. PANZERSCHRECK ANTHOLOGY PANZERSCHRECK SALVO! 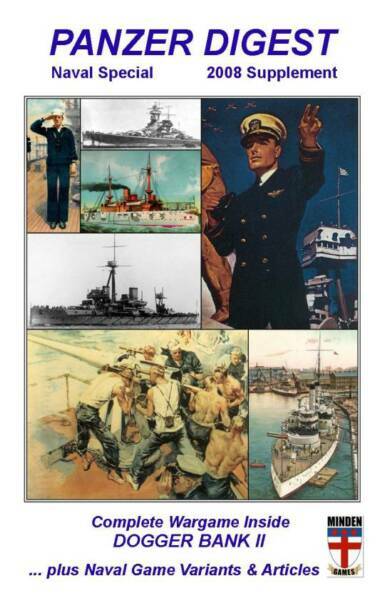 SOLITAIRE NAVAL GAMES . Please visit our ORDERING PAGE for complete ordering information, and links to all of our other games and magazines. The game included in this issue is the tabletop tactical WWI naval miniatures game, DOGGER BANK II. Each warship is rated for firepower (bow, broadside, and stern), armor, speed, size (in terms of tonnage), and main gun size and range, which gives the proper "feel" to each ship. Scale is seven turns/hour, and 1 inch = 1000 yards. This edition is a expanded and enhanced version of the first edition, which originally appeared in 2001. It now includes 24 fully-rated ship counters (battlecruisers and armored cruisers) that took part in the original 1915 campaign, plus additional scenarios (including Falklands 1914, and Goeben vs the Cruisers 1914), more optional rules, modified Fire Combat Tables (now more in line with those of the Advanced Tables of DREADNOUGHTS & BATTLECRUISERS), a set of color damage markers, and a Reference Card. DOGGER BANK II emphasizes playability and historicity. It's a complete package. Finally, there are several articles in this 22-page edition, including a variant for Avalon Hill's classic, JUTLAND, Experimental Rules for GREAT WAR SALVO!, reviews of naval rules published by A&A Game Engineering in Britain, and articles accomanying the bonus ship inserts for BATTLESHIP CAPTAIN and NAVTAC 1914. INSERTS: Dogger Bank II Ships, Reference Card, Game Markers. Battleship Captain Sheet 25: What If? Ships. NAVTAC 1914 Extra Ships. All told, this Naval Special is loaded with wargaming fun! !